16 November 2018 (Toronto, ON) – Before he became the Rhinestone Cowboy, Glen Campbell secretly recorded demos for several years for The King of Rock and Roll, Elvis Presley. A new album is out today on Capitol/Ume/Universal Music Canada, the country’s leading music company. Aptly named Sings For The King, the album collects together some of these rare songs that Glen sang for Elvis. Originally intended for The King’s ears only, fans of both legendary artists can now enjoy this discovered piece of history that has gone completely unknown about for more than a half a century. Many of the songs were made famous by Elvis in his movies with on-screen performances of tracks such as “Spinout,” “Easy Come, Easy Go,” “Clambake” and “Stay Away Joe.” The album, available on CD, vinyl and digitally, opens with a newly constructed Glen-Elvis duet of the poignant gospel song “We Call on Him,” which fuses their voices together allowing listeners to hear how Glen set the stage for Elvis and how the two superstars would have sounded together. Order Sings For The King now: https://musicvaultz.lnk.to/SingsForTheKing. The collection is also available on limited edition 180-gram clear vinyl exclusively at GlenCampbell.com. 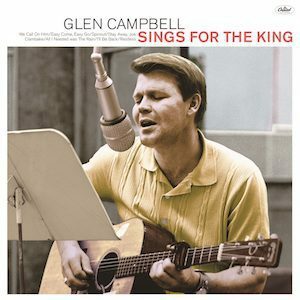 Glen recorded the songs featured on Sings For The King between 1964-1968 in between recording hundreds of sessions with the Wrecking Crew, touring with the Beach Boys, and recording his own albums. Sings For The King includes songs written by the songwriting team of Ben Weisman and Sid Wayne. Weisman is significant for having written the most songs recorded by Elvis than any other songwriter in history at 57. Weisman and Wayne turned to Glen Campbell who had perfect pitch and an uncanny ability to match Elvis’s key and even mimic his delivery, to record fully fleshed out studio versions that they could present to Elvis for his recording consideration. The songs were discovered by Executive Producer Stephen Auerbach who found the fifty-year-old recordings on long-forgotten reel-to-reel tapes in a storage space belonging to his wife’s uncle, Ben Weisman. Of the 29 recordings that have been rescued, there are twelve of Glen’s recordings that went on to be recorded and released by Elvis including “Stay Away Joe,” “Clambake,” “Spinout” and “Easy Come, Easy Go,” which were all made famous with iconic singing performances of the title tracks in his movies.